The Episcopal Church in Minnesota is extremely blessed to have an abundance of saints past, present, or yet to come. Close to the top of list of those who have used their gifts to bring forth transformation in Minnesota is Sister Annette Relf. In 1894 Sister Annette approached the Reverend John Jacob Faude, minister of Gethsemane Church in Minneapolis, with the idea of establishing a home for aged and infirm persons of the diocese. The project was not successful in Minneapolis (if, indeed, it was ever started there), and on the advice of Bishop Mahlon N. Gilbert of the diocese of Minnesota, Sister Annette moved to St. Paul. She took a house at 719 Martin Street, where she opened a home for children and aged women. In a year or two she moved to 527 John Street. In 1897 the diocese took over the home and incorporated it as an institution of the Protestant Episcopal Church, caring primarily for aged women. Sister Annette remained at the home as matron, nurse, and finally resident until her death in 1915. As you see, two of ECMN’s crown jewels (Sheltering Arms and Episcopal Homes) stand on the saintly shoulders of Sister Annette Relf. This coming Monday, February 16th, on the 100th anniversary of her death, Episcopal Homes (1840 University Avenue West, St. Paul) will be celebrating their founder with a 30 minute program beginning at 1pm. 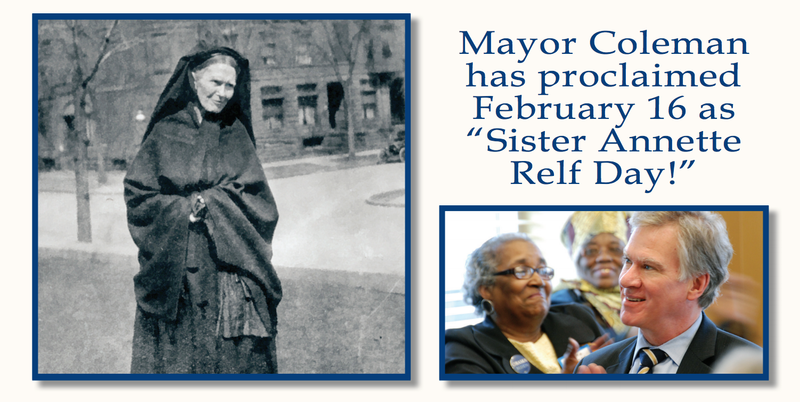 Mayor Chris Coleman will officially dedicate this day as Sister Annette Relf Day in St. Paul, and the program will include other speakers, including The Venerable Rev. Irma Wyman. Visit the event’s page on the ECMN website for more information on what is sure to be an incredibly powerful and moving program.